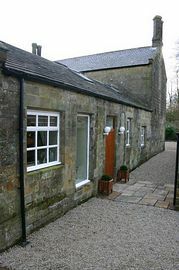 Keepers Cottage is situated in the peaceful countryside of Northumberland Naional Park. There are wonderful views of the surrounding hills and, in particular, Hadrians Wall. 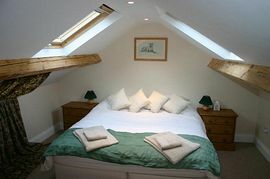 The cottage sleeps 4 people in cosy luxury. There are 2 bedrooms. 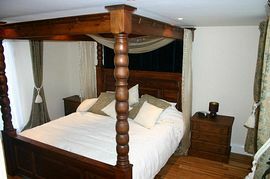 The ground floor bedroom has a 6 feet wide 4 poster bed, and has an en-suite bathroom. The upstairs bedroom can be arranged as a 6 feet wide double, or as a twin room if required. There is also an en-suite bathroom with a jacuzzi bath and a separate shower. 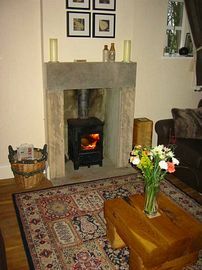 The sitting room has a woodburning stove with a free supply of logs. The central heating is oil fired and is controlled by room thermostats. There is a TV with Freeview. The kitchen is fully equipped with dishwasher, cooker, microwave, coffee maker and all kitchen utensils. The separate laundry room has a washing machine and dryer, and also a freezer. Home-made freezer meals are available if required. Luxury 5 star cottage with 4 poster bed. Near Hadrians Wall and Housteads Roman Fort. Patio area with table and benches. Garden area which extens into the adjoining woodland. Barbeque available if required. Local Services: The cottage is in a tranquil rural area with no other nearby properties. The nearest shops are at Haltwhistle (7 miles). The nearest pub is the Twice Brewed Inn (2 miles). 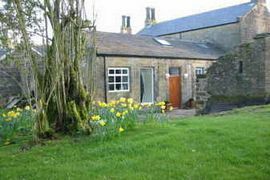 Keepers Cottage is about 5 miles north of the village of Bardon Mill, and about 2 miles north east of Steel Rigg on Hadrian's Wall. Weekly rates vary from: £300 low season, to £840. Changeover day is usually Friday. Short breaks are sometimes available in low season.